Send’em Off Smiling is a volunteer organization. 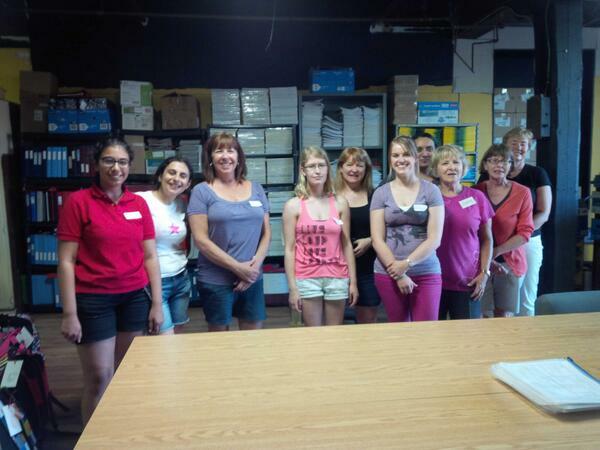 Our work is made possible by the generous contributions of time, skill and energy of our many volunteers. We require a broad range of volunteers each year. From filling backpacks to quality checking, from delivery day to pre-season planning, we can use your help. For more information, call us at (519) 746-4242 or email us directly. The best way to help Send’em Off Smiling this September is by purchasing the necessary clothing, backpack and supplies for one of the SOS children on our list. You can make a Shop and Drop commitment at any time; just contact us to let us know that you’re interested, and advise us of any preferences you might have (boy or girl, plus any age preferences). Near the end of June, we will provide you with a Child Profile and you can do the shopping. Drop your completed backpack off at one of our Shop and Drop stations in July — and be sure to include your receipts. We will issue a tax receipt for your charitable contribution in the New Year. For a copy of the tax receipt form click here. Although the cost to sponsor a child can vary depending on the selections you make for your child, you can expect to spend between $100 and $150. You can see more about our backpack basics here. To make your Shop and Drop commitment for this year, you can call us at (519) 746-4242 or email us directly. Volunteer with Send’em Off Smiling! To set children in need on a more hopeful path, by outfitting them with clothing and school supplies. We invite you to help us!